Boeing and Saab have selected Collins Aerospace to provide two key systems for the T-X trainer. The company—formed by the merger of Rockwell Collins and UTC Aerospace Systems when United Technologies completed its acquisition of Rockwell Collins in November 2018—is to provide the aircraft's fully integrated landing gear system and its ACES 5 pilot escape system. The undercarriage system comprises structure, actuators, dressings, hydraulics and wheel/brake assemblies. The ACES (advanced concept ejection seat) 5 is the latest iteration of a successful family of seats that originated in the Douglas ACES of the 1960s. The ACES II became the standard seat for U.S. Air Force types, equipping the A-10, B-1, B-2, F-15, F-16, F-22 and F-117. Built by both McDonnell Douglas and Weber, the ACES II program was acquired from Boeing by Goodrich in 1999, itself being bought by United Technologies in 2012. ACES 5 is a new generation of seat that retains many of the features of the ACES II but has been designed to accommodate a much wider range of occupant weights, in line with the U.S. Air Force’s policy of broadening its aircrew weight range from 140-211 pounds, to 103-245 pounds. Collins employs the 103-pound “Lois” (lightest occupant in service) and 245-pound “Lard” (largest anthropomorphic research dummy) instrumented test dummies to test the upper and lower end of the spectrum. The seat employs an advanced rocket system that automatically adjusts its thrust for varying weights, offering a “soft” ride for the occupant that reduces the risk of spinal injury, and a STAPAC (stability package) that compensates for varying pitch effects caused by differing occupant weights. Other features include advanced passive head and neck protection that takes into account the different shape and balance characteristics of modern helmets and their various display systems, including nuclear flash goggles, as well as a net-based arm and leg restraint system. Later this year, Collins will begin deliveries of the similar ACES II SSIP (Safety and Sustainment Program) seat for the Northrop Grumman B-2 fleet. 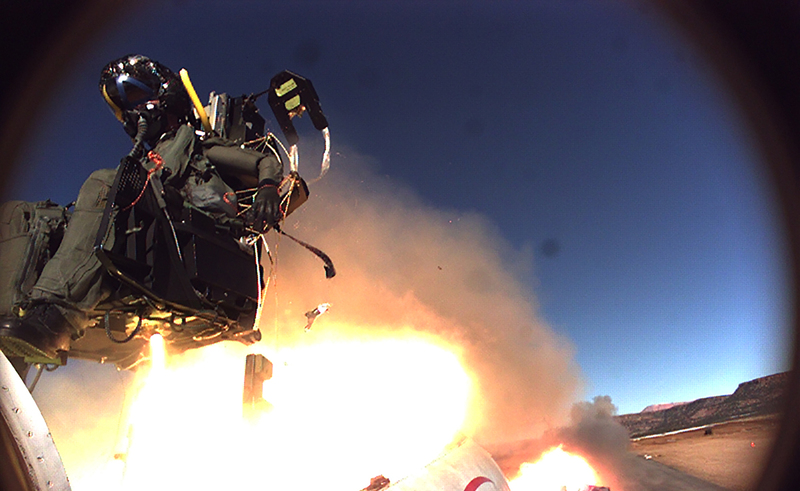 The upgraded seat completed qualification tests in 2018, having performed eight sled tests on the company’s 12,000-foot test track at Hurricane Mesa, Utah.